● Mub & Grub Intro – Join Mub and Grub for an EPIC tour through the special features of this Blu-ray! ● Birds, Bugs and Slugs: Forest Explorer – Journey into the forest to meet the real-life counterparts of the EPIC world! ● Rot Rocks – Mandrake might be the bad guy, but his world of rot benefits ours in a number of ways, let’s discover how! ● Bugs of Camouflage – Join us to find out how bugs use their environment to hide right under our noses, just like the Leafmen! ● The Epic Life At Two Inches Tall – How would your life be different if you were only two inches tall? Aside from being small, there are some surprising and amazing benefits! ● Mysteries of Moonhaven Revealed – Meet the incredibly talented filmmakers, artists, and animators at Blue Sky, and learn all about the making of EPIC! Blue Sky Studios, Director Chris Wedge and the animation team behind the Ice Age movies, Robots (2005) and Rio (2011), are at it again with this latest release, now called Epic (an upgrade from its original title, Leafmen). Unfortunately, it seems pretty much like a mixture of Avatar (2009) and Arrietty (2010). It is an animated adventure that’s seemingly tailor-made for family summer viewing. However, the problem with this latest effort is that as thoroughly delightful as the film’s visuals are, there’s just nothing very interesting about Epic’s tiny storyline or its efforts to create a real fantasy story that children can connect with. The kids who made up the majority of my screening audience seemed more fidgety than usual and worse yet, there was an obvious lack of frequent laugh-out-loud outbursts as one would expect of such an audience. This to me was very surprising considering these (Blue Sky Studios) were the same people who dreamed up the mega hit series, Ice Age. And despite an impressive list of celebrity talent attached to the project, you have the erroneously blurted tag-lines, poor adult-driven dialog and an idea-starved story feverishly vying to conceal its shortcomings. Epic simply seems to lack personality, a cohesive storyline and the aforementioned sense of kid friendly, easy-to-follow dialog. While it’s easy to get lost in the details of the fantastical world of the visuals here, one can’t help wishing the writers would’ve employed the same attention to detail as they did with the previously mentioned animated releases. Twentieth Century Fox Animation and Blue Sky Studios today announced the voice cast for EPIC, a 3D CG action-adventure comedy that reveals a hidden world unlike any other. 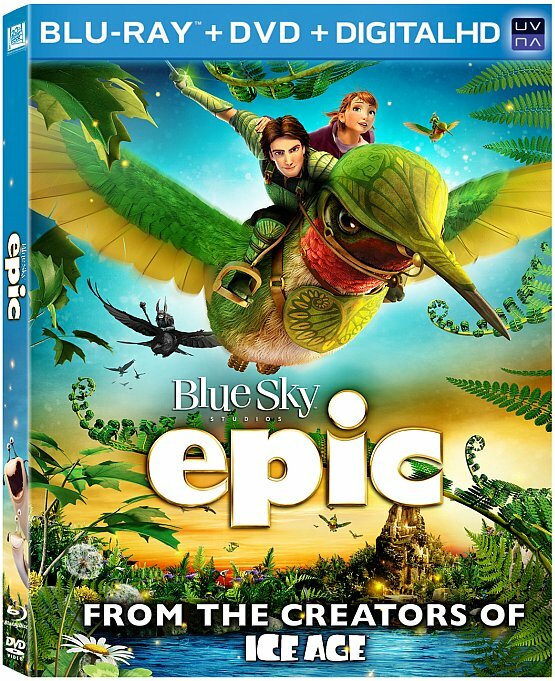 From the creators of ICE AGE and RIO, EPIC tells the story of an ongoing battle deep in the forest between the forces of good and the forces of evil. When a teen age girl finds herself magically transported into this secret universe, she must band together with a rag-tag team of fun and whimsical characters in order to save their world…and ours. BEYONCÉ KNOWLES, one of the most widely recognized and highly respected women in pop culture and star of the upcoming “A Star Is Born,” voices Queen Tara; COLIN FARRELL (“Total Recall”) is Ronin; JOSH HUTCHERSON (“The Hunger Games”) is Nod; AMANDA SEYFRIED (“Dear John”) portrays Mary Katherine; and JOHNNY KNOXVILLE (“Jackass”) voices Mandrake. AZIZ ANSARI (“Parks and Recreation”) portrays Mub; and rapper PITBULL voices Bufo. JASON SUDEIKIS (“Horrible Bosses” and the upcoming “The Campaign”) portrays Bomba; and rock legend and “American Idol” judge STEVEN TYLER is Nim Galuu.